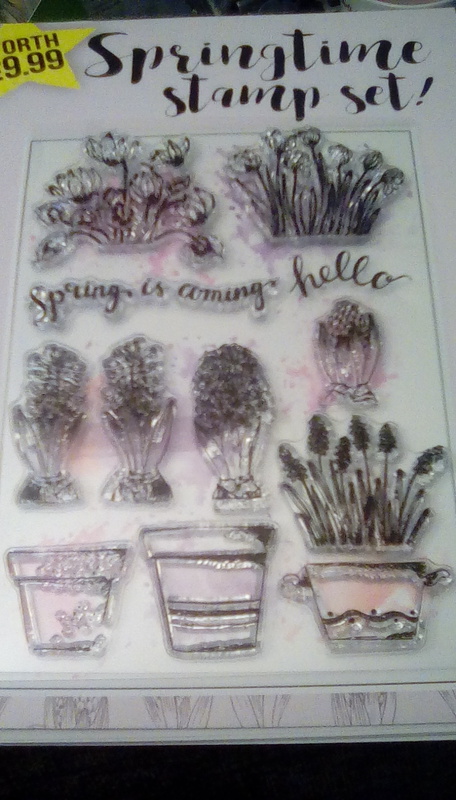 My copy of April 2017’s Making Cards Magazine arrived today, complete with fun llama, cactus and Mexican girl papers, pretty watercolour style florals and lovely spring stamp set. I really enjoy fussy cutting, I find it very relaxing. The fun Mexican-inspired papers are ideal for this. 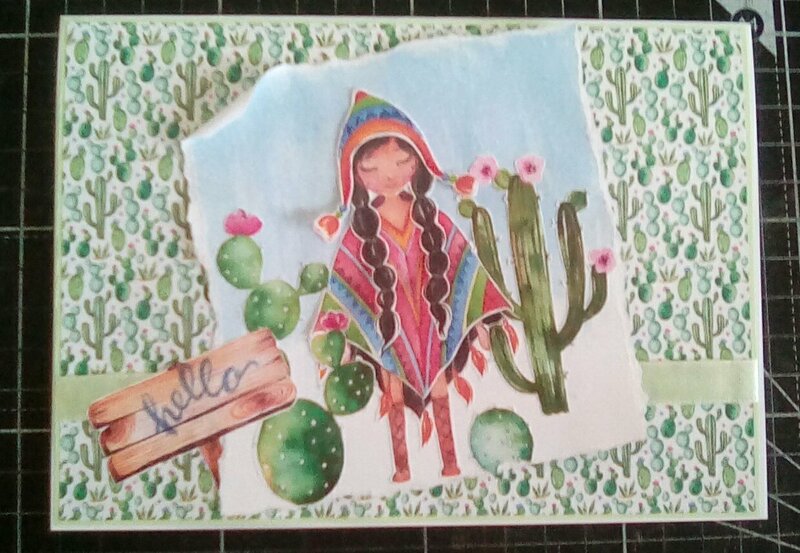 I sat happily watching a Disney film as I cut out the decoupage of the Mexican girl, three cacti and one of the signposts. The cactus paper is great, so quirky and it really made me smile. I had a turquoise ribbon scrap which coordinated well with the tones in thge cacti, and I dug out a sheet of paper in a very similar shade to use for my matting and layering. I was stuck for how to present the little scene I had cut out, till I remembered the tutorial published by Kathy Crafts this week on creating an ink wash. I really like the look of blended backgrounds, but I don’t seem to be able to do it, but I thought I would give an ink wash a try. I think I used a little too much water as my card buckled, and I made it a bit too even, but overall I was pleased with my first attempt. At first I had a neat rectangle with my ink washed sky at the top, and I built up the scene I had cut out, but it didn’t quite look right. It was too neat. I tore the edges and much prefer the more relaxed look. The ‘hello’ sentiment is from the free stamps. I was very impressed as it stamped perfectly using the lid of the ink instead of an acrylic block! (Sometimes when I realise I want a sentiment it’s late in my crafty day and I get lazy, my stamping drawer is a whole four or five steps away). 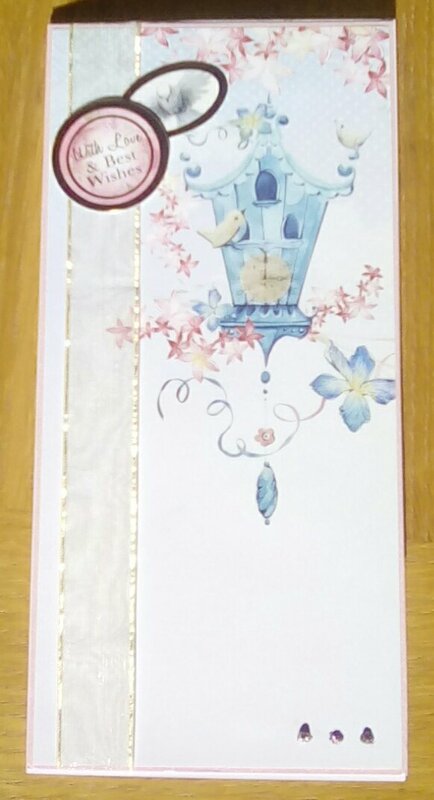 I wasn’t quite sure where to put the sentiment signpost, so I built up my card front and tried it in several positions before I chose to have it slightly tucked behind the topper. This entry was posted in cards, craft on March 27, 2017 by Isn't She Crafty. The sun is shining, gorgeous looking day here. I had such good intentions of going out and addressing the chaos which used to be my garden (lots of rain+several sunny days=madness), but I settled down with a cuppa and one of the brownies I made yesterday and accidentally picked up a paper crafting kit to glance through, and tewo hours later my tea is cold and I’ve made four Christmas cards. 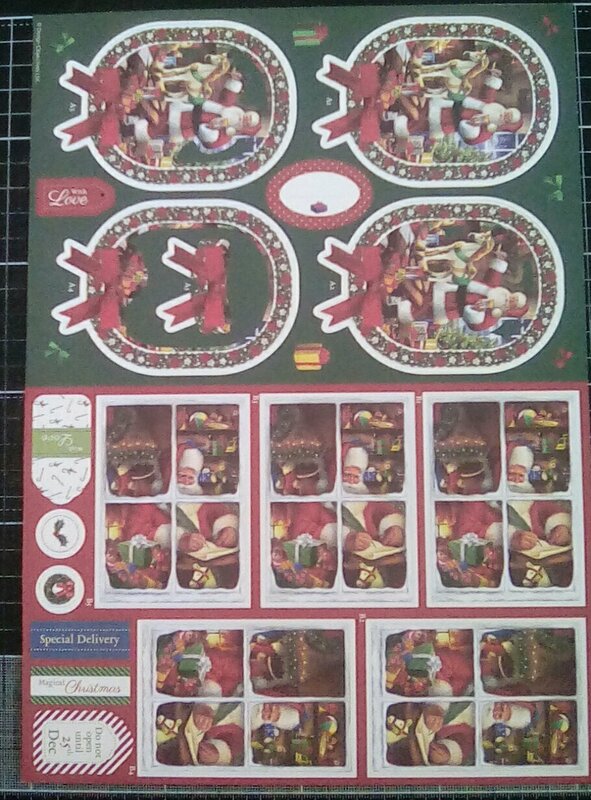 The kit I picked up today was the DoCrafts A Christmas Wish collection. Lovely, traditional images in this, and some great little embellishments including red velvet bows and little gold bells! Mine also includes decoupage, build a cracker sheets and create an envelope sheets. As many of you know, I’m trying to reduce the storage space my stash needs, so I took one sheet to try to use up again, then got carried away and made more. 3d decoupage this time. Does this remind anyone else of a well known fizzy drink? 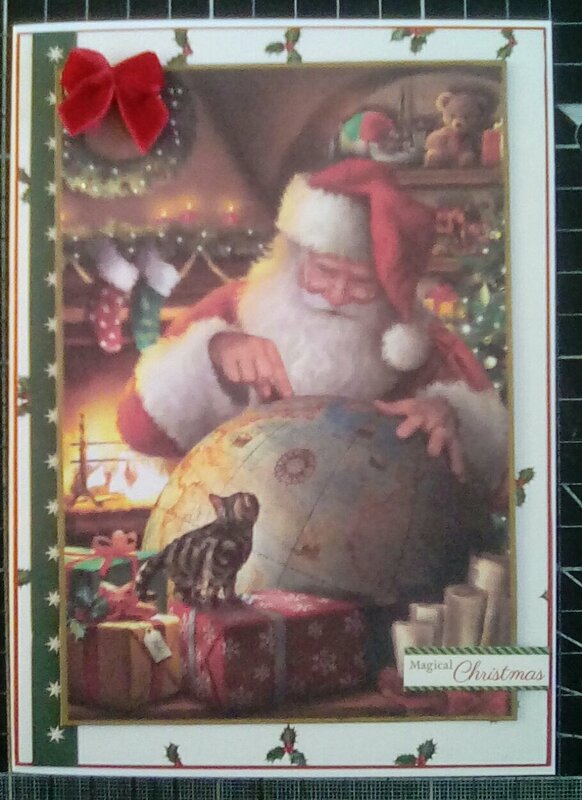 This entry was posted in cards, Christmas, craft on March 24, 2017 by Isn't She Crafty. My gorgeous Goddaughter Laura will be 5 on the 29th. I was honoured to meet her when she was four days old and I have adored her ever since. His Lordship who is terrified of children (that’s got to change by November) also adores her; she’s got such a determined, stubborn, funny little character. Laura loves bright colours, pink and shiny things. She always seems to opt for mismatched but fun combinations, so that was where my inspiration for her card came from. General child friendly fun chaos. I bought the sequined sequin card from Create and Craft recently, then stared at it when it arrived thinking it’s so pretty and shiny but what on earth am I going to use it for? Laura! The murky weather we’re experiencing is making it almost impossible to get any hint of the shine of this card on a photo, I apologise. Stamp the bear and colour him in. 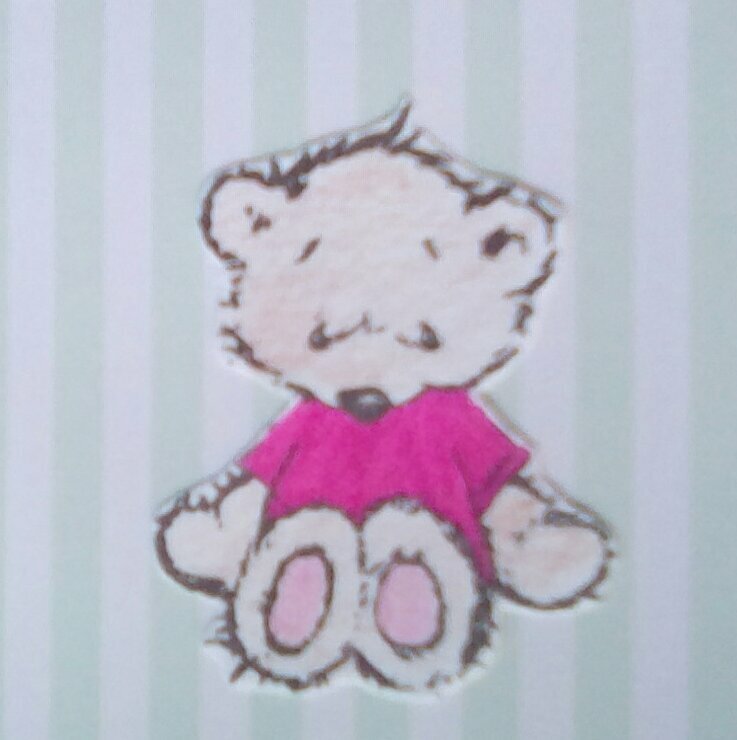 I used a pink glitter gel pen for his T-shirt – you’ll notice a general shiny theme to this card. Fussy cut around the bear. Cut the letters of the name from a sheet of sequined sequin card of your choosing. My letters were 255mm tall. I chose one which would clash with the rest of the papers – much darker and reds and greens – because of Laura’s penchant for clashing. Keep them to the side. Cut the age you need from a different sheet of the sequined sequin card. I used a pink base to tie back in with my colour scheme. I made mine much bigger than my letters at 555mm tall. Keep this to one side. Choose a patterned paper which will be your back layer and your rosette. I opted for one with pink hexagons on. Cut a piece 91x 203mm, then cut out of the middle of this two strips measuring 30x180mm. Make a rosette: take the two strips and score at regular intervals, using your rosette scoring board if using. Mountain and valley fold along all the scored lines, then use a strong adhesive (I used super sticky red tape) to attach the two strips into a circle. Squash your circle flat; I tend to put a piece of 3d foam tape on the reverse to hold it long enough to stick. Fill the hole in the centre with hot glue (it seems to hold best). If I wasn’t going to put a number over, I would usually hide the hole with a gem or a button. Using hot glue or wet glue, stick your number from step 3 onto your rosette, roughly central, but making sure to disguise the hole in the middle of the rosette. 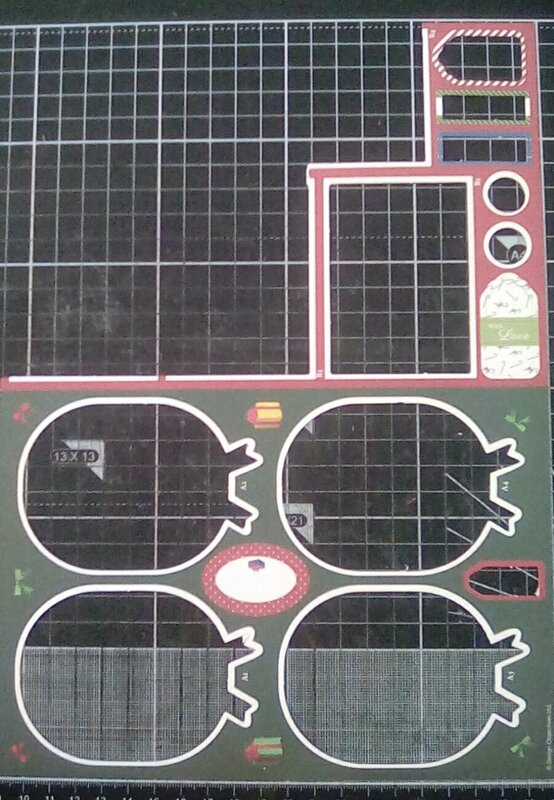 Cut a piece of a second patterned paper to 85x195mm and layer this on top of the piece of larger patterned paper from step 4. Stick the two onto the front of your card blank. Trying to fight the hollowed out bottom layer onto the front on its own is really faffy, but the second layer lends it support. 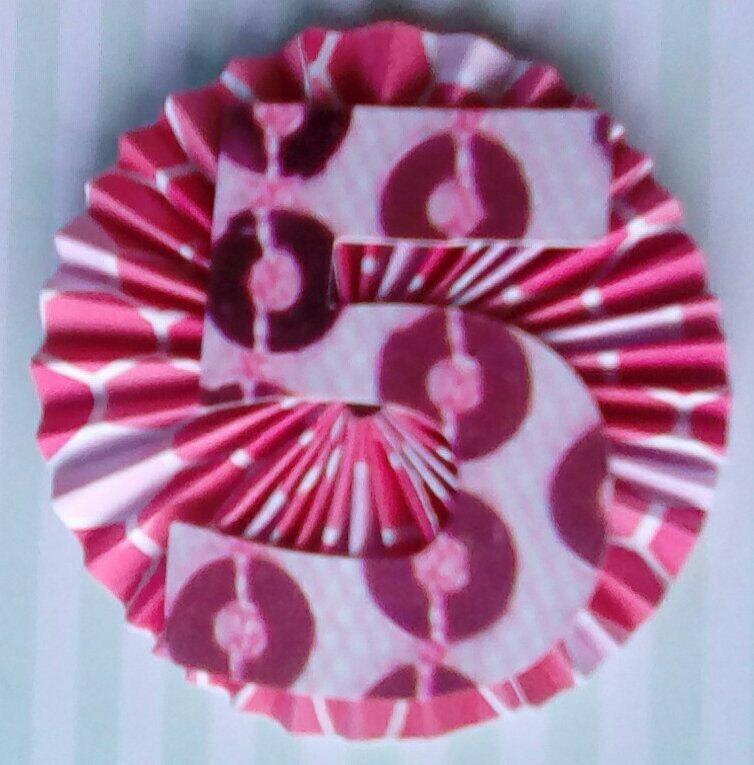 Stick your rosette in the middle of the top third of the card front. Stick the letters forming the name as you wish – Laura fit almost exactly across the middle, but a longer name would need a bit more manipulation. 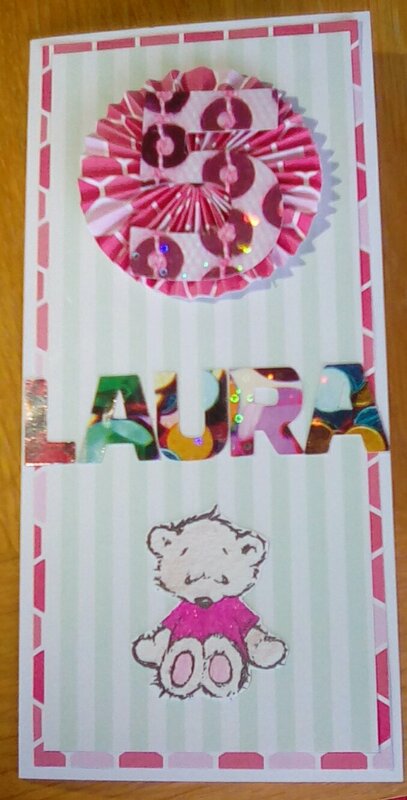 Finally stick your bear in the middle of the bottom third of the card front et voila, finished. This entry was posted in cards, craft on March 22, 2017 by Isn't She Crafty. 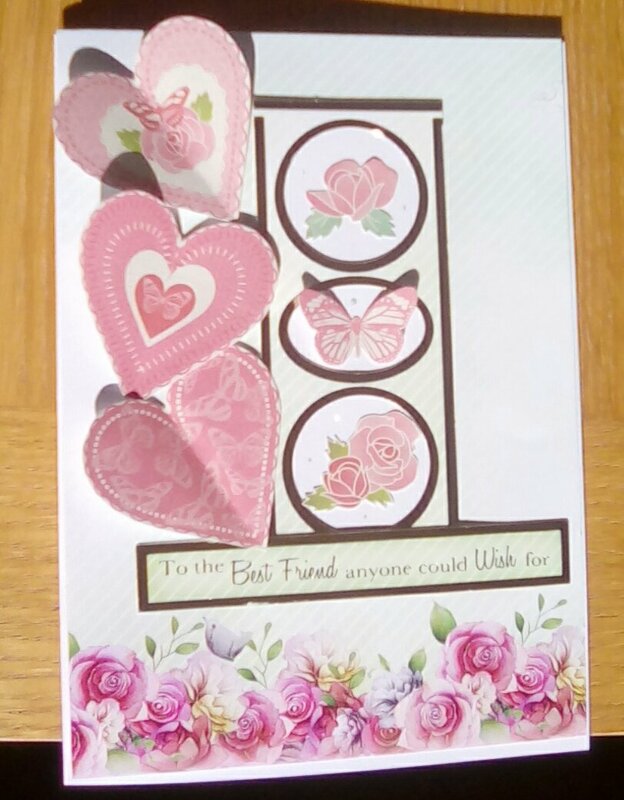 With mother’s day around the corner, I have taken a break from Christmas cards and grabbed a different card kit (still trying to reduce storage space needed) to make my wonderful mum a card. Mother in law’s is made – she cross stitches too, so the little stitched bucket of flowers will be winging its way to Hull when His Lordship gets round to writing the card. 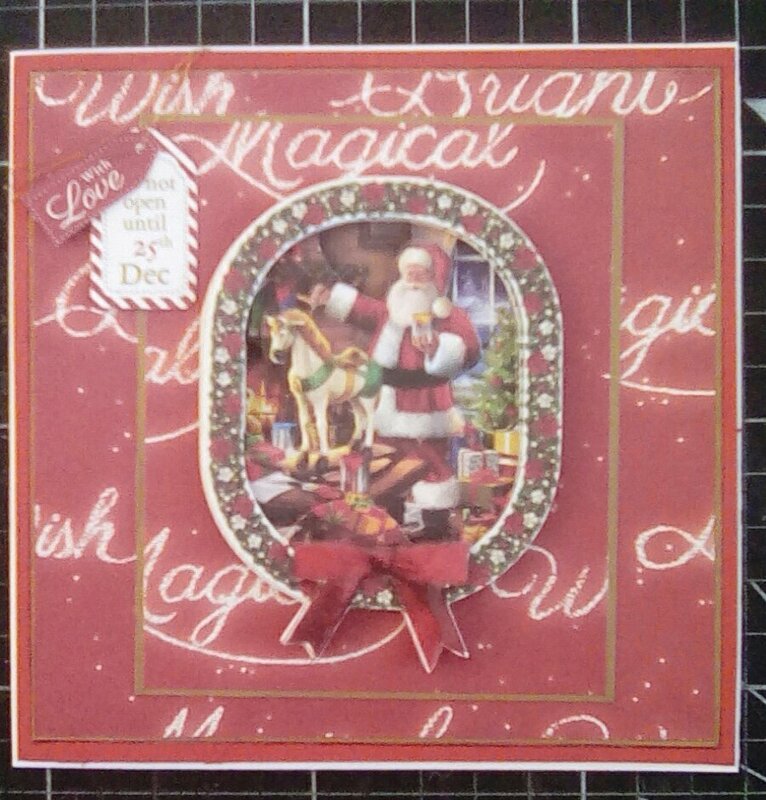 Although this card is a quick make and made from a kit, it’s a kit I like as it leaves plenty of room to be creative and put your own spin on your makes. I based my card on this sketch from Tuesday Morning Sketches (#234). I have Pinterest boards of rectangular and square card sketches for those times mojo or inspiration is running low. I find them especially helpful when I have a kit and have been staring at a topper, unsure of how I want to use it. 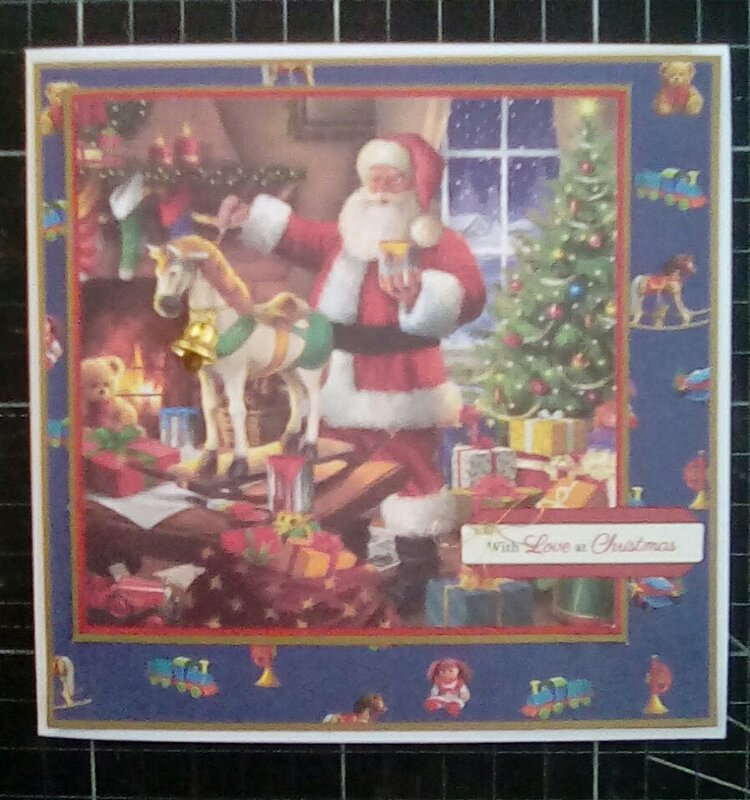 With today’s card, I liked the topper but as it’s big (95x95mm), I found it kept overwhelming my ideas for a layout. I felt the sketch I chose meant I was encouraged to keep the background relatively simple which best showed off the papers. 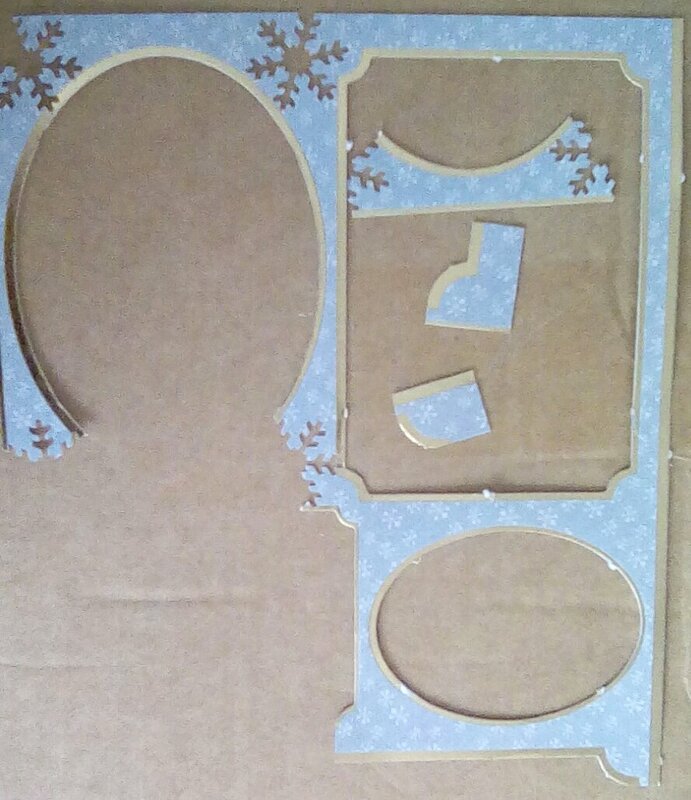 Cut a piece of Kraft card to 145x145mm. Onto this layer a piece of peach paper with white polka dots and a piece of the floral striped paper from thekit, each measuring 140x70mm. Make sue the outside borders are even, if the central line isn’t quite right it doesn’t matter as you’ll be covering this. Wrap a piece of crochet lace around the middle of the card, covering the join in the papers. I put a little bit of All Purpose glue in the middle as it would behidden by my topper and gives a but more stability, then I fastened the ends behind the card so the front looks neat. 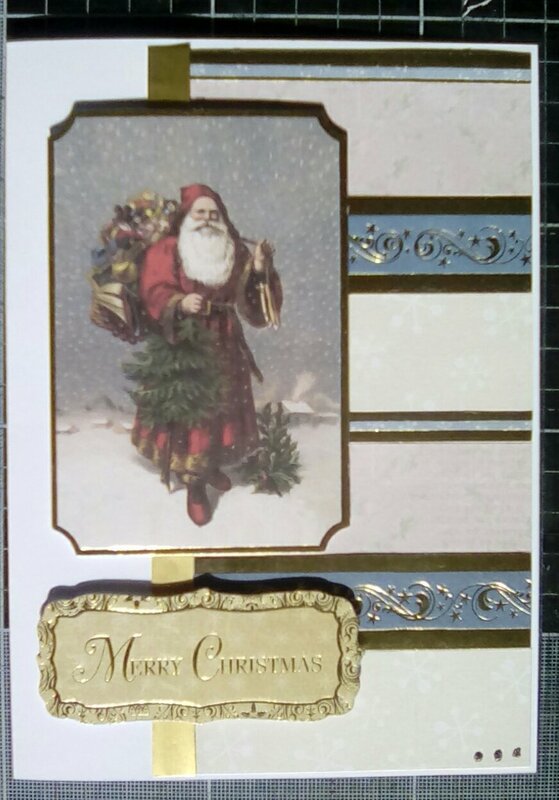 Glue, or use double sided tape, your card front to the card blank. This is earlier than I sometimes do, but it means I then don’t smudge other elements. 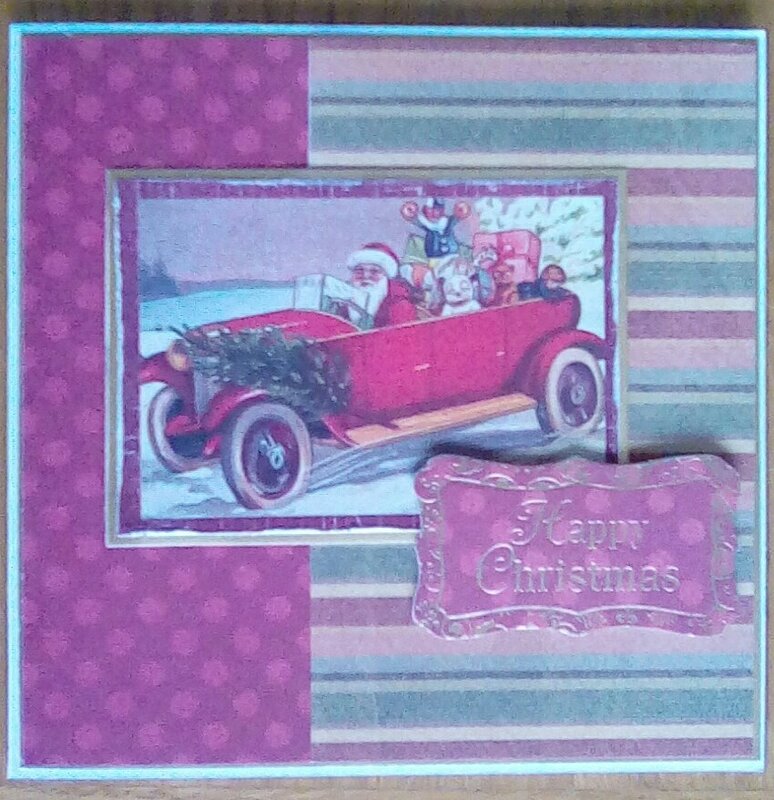 Cut a square 100x100mm of the darkest (maroon, maybe) pearlescent card from the kit, and a scalloped edged square from the peach pearlescent card measuring 110x110mm – I used my Scan’N’Cut for this, but dies or pinking shears should work. I always hollow out my layers to save card and because I find by keeping the weight of the card front down it helps it to stand well. Use the purple pen to ink the edges of the topper and both squares. Make sure you’ve trimmed any little notches on the topper where it was fixed into the sheet or these will soak in more ink and look uneven. 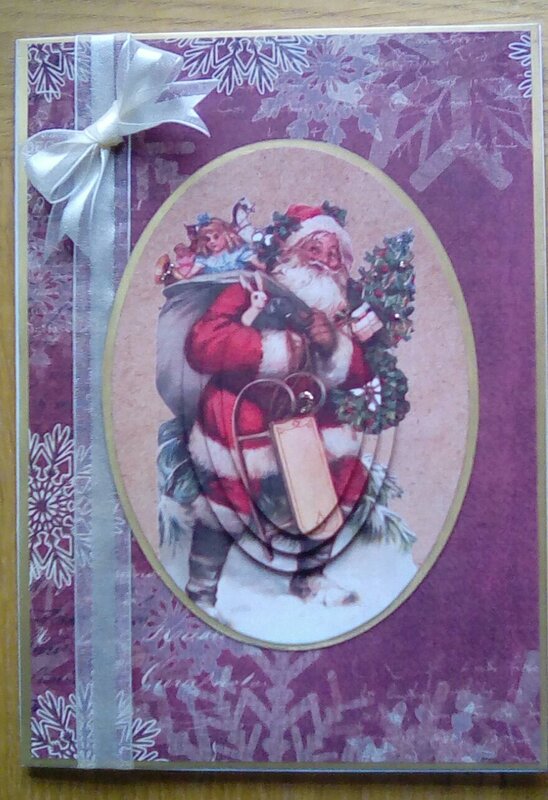 Layer up your squares and topper, then stick centrally on your card. I didn’t use 3d foam for this and the layters already made my topper stand proud, but it would work if you want lots of dimension. Finally embellishments. I put a bow made of the crochet lace to the left of the topper, on the lace which was already there (I use All Purpose glue for sticking fabrics, I find it holds really well once dry, but it’s quite yellowy so be careful). I put 3 pearls in the bottom right hand corner, and finally I used Glossy accents to pick out the middles of the white flowers. This entry was posted in cards on March 15, 2017 by Isn't She Crafty. As His Lordship and I work most weekends, I never really managed to get into a routine of doing craft fairs. I do, however, do a fair for the local hospice at the end of November. My mum pointed out when I last saw her that I won’t really be able to man my stall this year as I’ll have a teeny baby in tow, but she is going to step in because she’s wonderful. She also made another good point: as Dot grows, making cards and other treats is going to get less easy, so it’s going be a year of Christmas crafting with as needed fun in between. 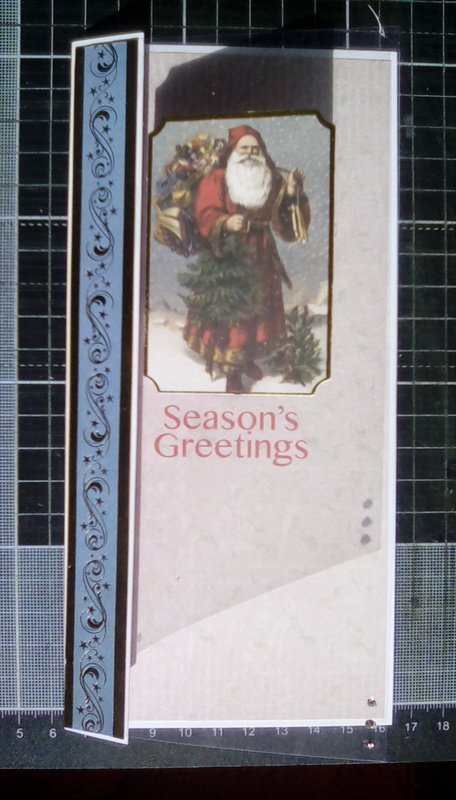 The kit I picked up to use today was the Kanban Vintage Christmas collection. 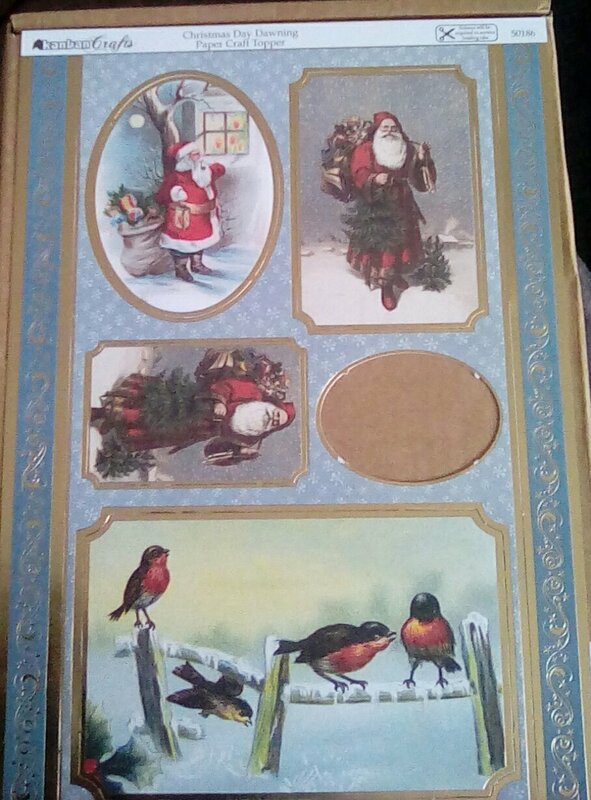 I love this, the colours are muted and vintage, with gorgeous old fashioned, traditional images which are perfect for Christmas and the season in general, and the sentiments are lovely, including Happy New Year as well as more typical ones. 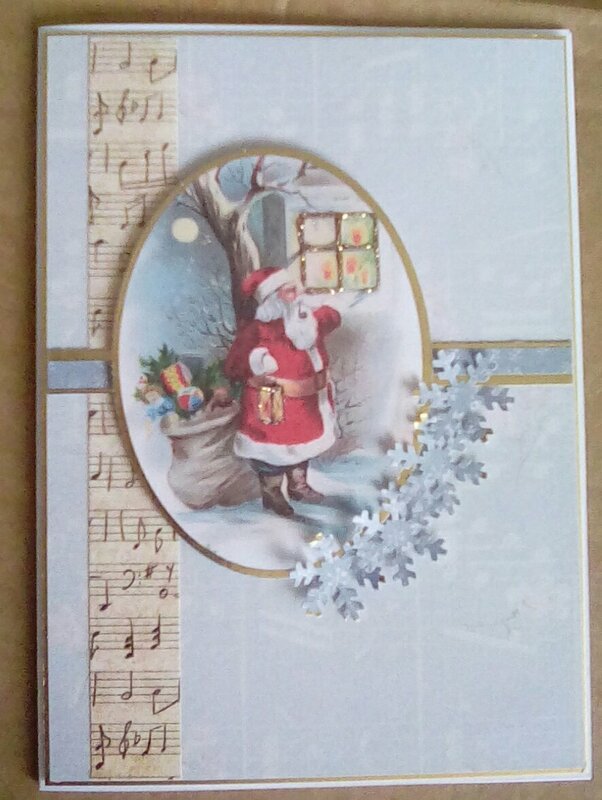 The set includes toppers, backing papers and inserts. I have mainly used Kanban gold card for matting and layering. I like that it’s subtle but festive. I do like mirri board, but it can be a bit too much for some projects, a bit too shiny and in your face. One of the great things about this kit is that there are sheets with loads (12) relatively simple toppers, as well as sheets with fewer but more complex designs. I picked out a couple of toppers I liked to play first, then chose a sheet to try to use up, so the photos should show the order. I have added a few stash essentials, but these are mainly using the kit. 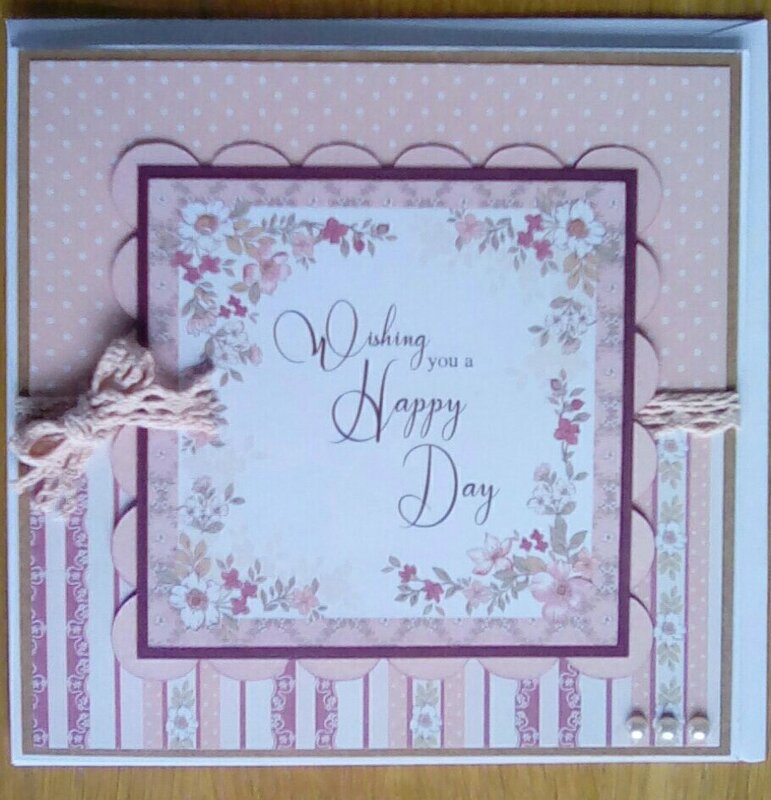 This entry was posted in cards, craft and tagged Kanban on March 13, 2017 by Isn't She Crafty. With Little Dot expected in November, I am aware that I need to somehow create space in our house. The things of mine which are by far most bulky are my coats (one to go, the others are justifiable) and my crafting stash which is certainly not being donated away. I’ve made a pact with myself to not buy any more, the purchase yesterday was before the pact… Instead I set myself the not so difficult challenge of using what I’ve got. Not only should this hopefully refuce the storage space needed (slightly), but I think it’ll be quite fun to revisit my old supplies. Does anyone else buy things, get really excited bythem, then tidy them away and even at times forget all about them? I only do this with crafty bits, but I’m really bad for it. I find kit cards as I call them, especially Hunkydory ones, can be fun for a one off quick make and tend to look pretty with little effort, but get a bit samey quickly, and I almost never seem to use more than one topper from a couple of pages before I tidy the kit away and get out a collection and dies where I can feel moree creative. A while back I bought the Create and Craft member’s gift of Hunkydory Floral Breeze. 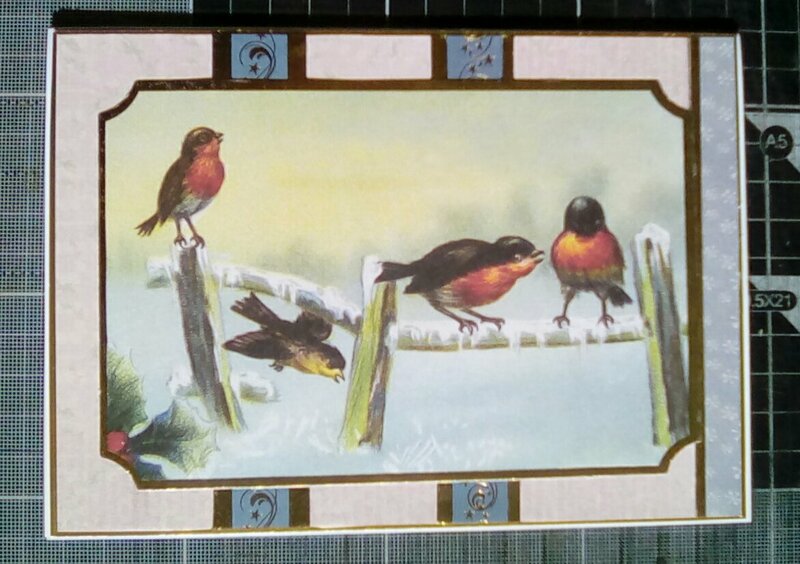 It’s a pretty kit, lots of gorgeous flowers, bird houses, outdoors-y romantic scenes. I had made 3 cards before I put it away and forgot about it. Today’s challenge to myself was to use up a page of toppers. I like to try to use the waste, get the most out of my stash, and this is Usk where I feel ii can add more of my own spin. Of the three cards I’ve made, one includes elements which came free with a magazine, the other two are purely from the kit, one using waste. The final photo is what’s left of the topper sheet. 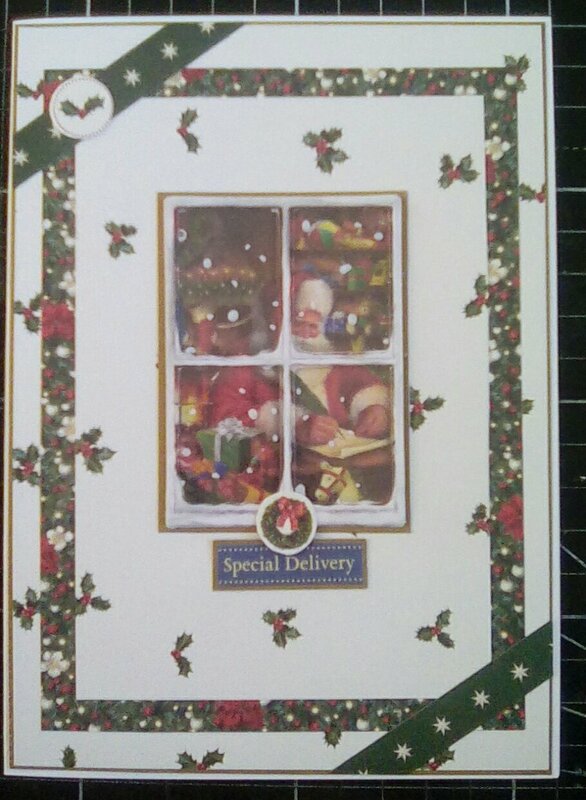 I will use it, but Dot’s making me feel far too icky for hunching over cards at the minute. 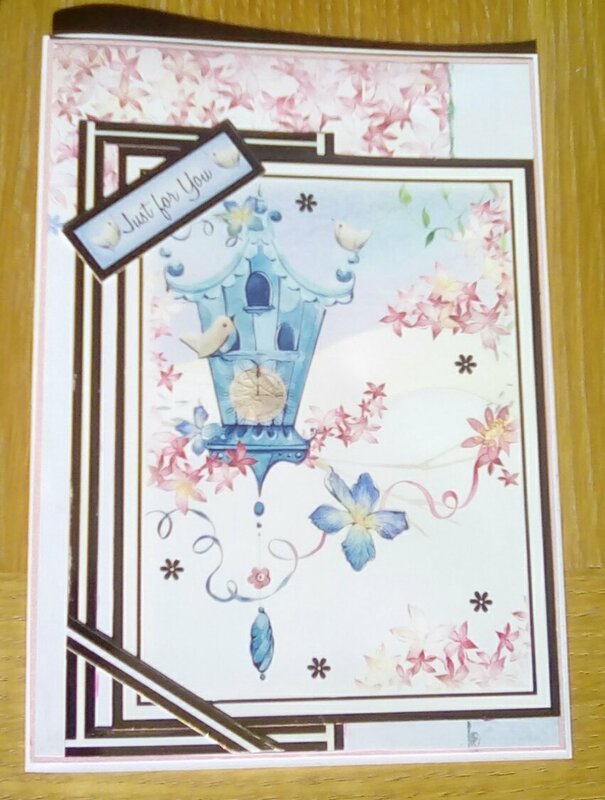 This entry was posted in cards, craft on March 8, 2017 by Isn't She Crafty.